The trial was initiated on May 8th at the Lewis-Brown Horticulture Farm in Corvallis, Oregon. The trial site is a mature lawn under dense shade (deciduous trees) and was originally planted to perennial ryegrass over 8 years ago. The site has since been invaded by annual bluegrass (Poa annua) with small amounts of rough bluegrass (Poa trivialis) and bentgrass and light to moderate populations of feather moss (Brachythecium albicans). The soil is a silty clay loam soil with a pH near 6.0. The weather was overcast on the date of application with the daily high temperature and relative humidity being 53 degrees Fahrenheit and 54 percent, respectively. The treatments were applied between 2:40 pm and 3:40 pm under full shade. The plots were irrigated the day before treatment and then lightly irrigated on the morning of treatment. The treatments were applied in treatment order from 1 to 5. All treatments were applied with a CO2-powered plot sprayer with a 5 foot boom using TeeJet 80015 flat fan nozzles spraying 2 gallons per 1,000 square feet. The products were applied at 4, 8, or 10 gallons of spray volume of per 1,000 square feet (see table of treatments below). The spray volume was achieved by spraying each plot multiple times depending on the desired spray volume. Before a new chemical was applied, a 2 liter bottle of clean water was sprayed through the sprayer to clean it out. A metronome was used the time each application. The plots were mowed weekly at 1 ½ to 2 inches with a rotary mulching mower. On days that the plots were rated, the plots were mowed to 1 inch with a bagging rotary in order to see the moss more easily. During the trial, the plots were irrigated using a computer controlled RainBird landscape irrigation system based on 60 percent of ET applied every other day. Supplemental irrigation was added to ensure that the moss did not dry out before all ratings were completed. Visual moss injury ratings were made on May 13 (5 DAT), May 15 (7 DAT), May 22 (14 DAT), and June 5 (4 WAT). Visual turf injury ratings were made on May 13 (5 DAT), May 15 (7 DAT), and May 22 (14 DAT). Visual percent moss cover ratings were taken at the beginning of the trial and then again on July 11. Moss control ratings were calculated for each plot as the difference between ending and beginning moss cover ratings divided by the beginning moss cover rating times 100. The data for each rating date were subjected to analysis of variance (ANOVA) and differences between means were determined by LSD at the 5% level. Moss is a non vascular plant without roots. As a result, it cannot translocate chemicals making it difficult to kill unless the entire plant absorbs the chemical. Complete kill is nearly impossible unless the turf canopy is opened up by dethatching prior to treatment and/or large water volumes are used to soak the moss thoroughly. At lower water volumes where the turf canopy has not been thinned, the turf and the top of the moss plant insulate the moss growing nearer the ground. Under these conditions, most moss treatments are only injuring the moss on the surface and then the moss subsequently recedes under the turf canopy until the fall rains come. In this trial, the untreated check had an apparent reduction in moss of 60 percent when rated from a standing position bent over with hands on knees (how the plots were rated). However, upon closer inspection, there was still moss under the turf canopy where it was not visible from a standing position. Under normal circumstances, untreated moss recedes into the turf canopy as the temperatures warm up. In this trial, there were no statistical differences between treatments for percent moss control (See Table 1). Moss-1 Basic (Trt 2) and Lilly Miller Moss-Out (Trt 5) had the best moss control at 79 and 72 percent, respectively. However, as stated above these were not statistically better than the untreated check which had a 60% reduction in moss cover. Five days after treatment, Lilly Miller Moss-Out (Trt 5) produced the most moss injury rating 6.7 out of 9.0 (See Table 2). Moss-1 Acidic (Trt 1) had the second most moss injury rating 3.7 which was not statistically different than Moss-1 Basic (Trt 2) which had an injury rating of 3.3. Moss injury from Garden Safe (Trt 4) increased slightly (from 2.7 to 3.3) from 5 to 7 days after treatment. Injury ratings did not change after 7 days after treatment. 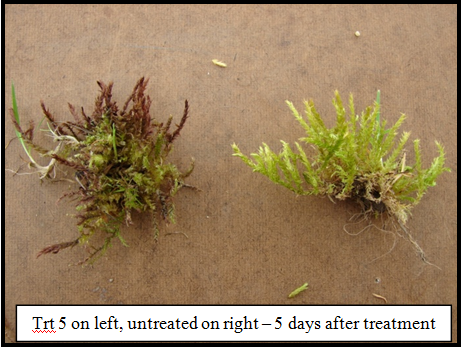 Moss-1 Acidic (Trt 1) produced moderate turf injury five days after treatment rating 4 out of 9. The injury was limited to leaf burn and no grass plants died. The plants completely recovered within 14 days (See Table 3).